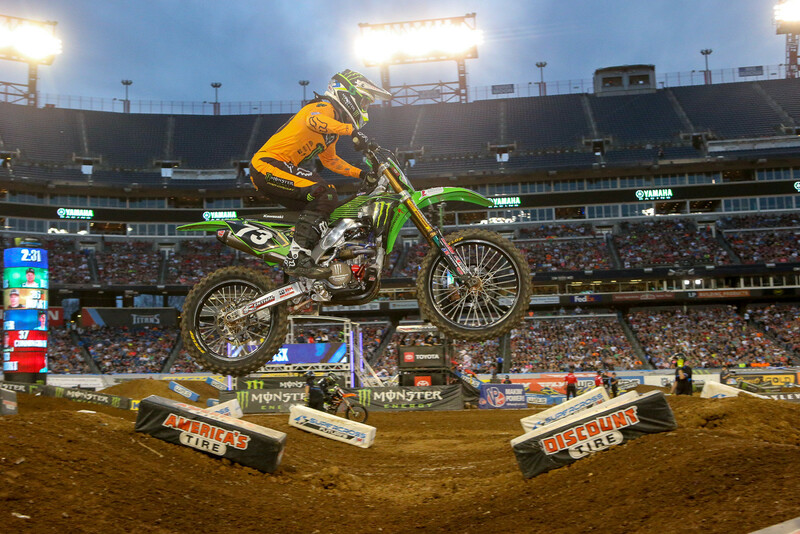 The 2019 Monster Energy Supercross in Nashville started with Monster Energy Kawasaki and Monster Energy Pro Circuit Kawasaki teams giving their executives heartburn. The only way I can describe their night is, “As bad as it went, it couldn’t have gone any better.” Kawasaki had a mechanical failure, a smoking bike, rider injuries, and LCQ stress followed by victories! They experienced a season of highs and lows in one evening. When it looked like they were out of contention for both the 250 East and 450 titles, their fortune changed for the better. The craziness started in the first timed 250 session, when Austin Forkner had a huge crash. Austin has been tempting fate all season long with his weekly crashes. How many times can a rider walk away from a big crash before suffering an injury? For Austin, the bill came due and his left knee looks to have suffered. I am not a doctor, but I have endured multiple knee injuries and both of my ACL tears came from impacts similar to Austin’s. While every knee injury is different, his injury looked to be an ACL tear to me. A complete ACL tear can leave the knee extremely vulnerable and unstable, ultimately causing further damage to other ligaments and the meniscus. This is crucial because more often than not, damaged meniscus is removed instead of repaired. The effects are not felt until the person is older, then knee replacement surgery is required. Most likely Austin will be given the option to tough out the pain and race much like Kyle Peters and Adam Cianciarulo did last season. The risk for further damage is very high, and is the risk worth the reward? This is something Austin will have to contemplate. Then again, every injury is different and it might not be an option, so stay tuned. Pro Circuit had to rely on 32-year-old Martin Davalos who just went under anesthesia to receive a neck injection a week ago. Davalos suffered a broken neck at Dallas last year and something in his neck is pushing on his spine causing issues with his arm and hand. Things were looking bleak in the Pro Circuit pits. Austin had a 26-point lead and if Chase Sexton won the race the lead would be lost. Their only hope was that the most experienced 250 Supercross rider on the planet would find his form and block Sexton from max points. The seasoned veteran did exactly what they hoped (with some help from Chase Sexton and Justin Cooper) and took the win. 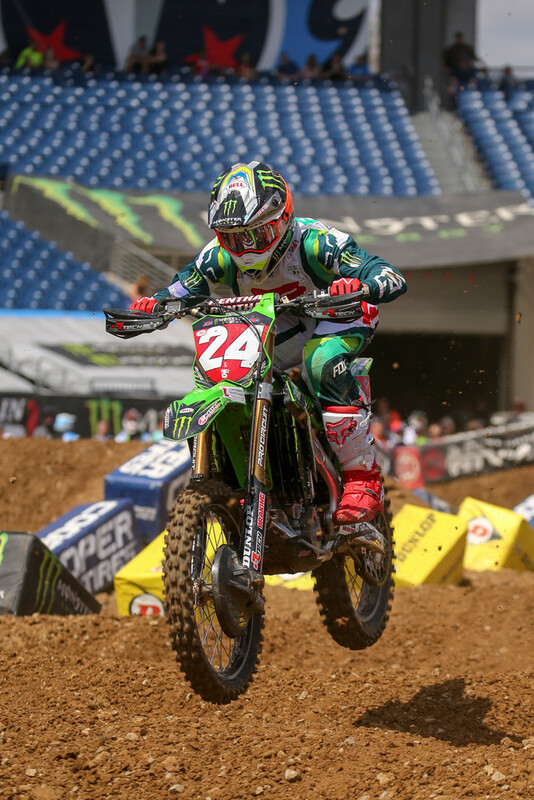 The 450 drama started when Monster Energy Kawasaki rider Eli Tomac suffered a bike failure in his heat race. Then in the LCQ, his bike looked like a 2-stroke fresh off Craigslist, with smoke billowing from the engine. With only a few minutes between the LCQ and the start of the main event, another complete engine swap was impossible. They had to tighten whatever they thought was causing the smoke and hope for the best. 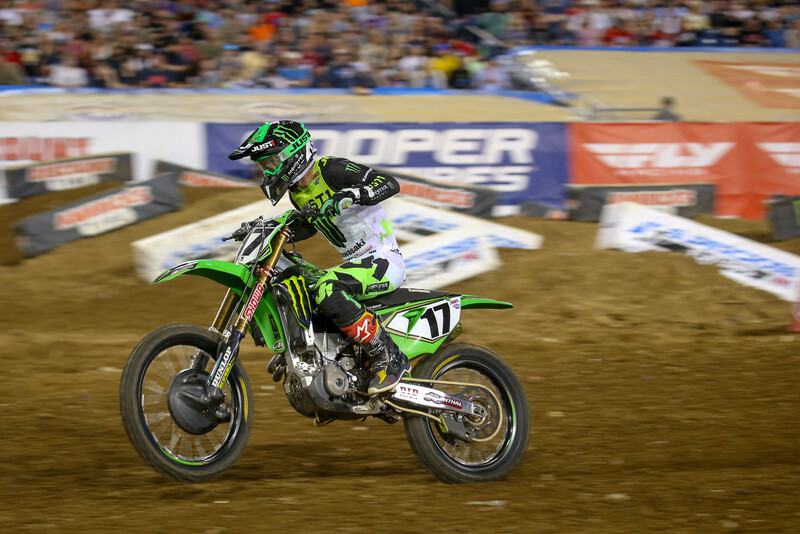 After the first couple laps of the main event, Joey Savatgy was in second and looking good. A nasty washout of his front wheel left him walking off the track holding his arm in a way that had me believing his shoulder was out of the socket. His Instagram post following the race was cryptic at best. He said, “Sore but I’ll be good,” which leads me to believe it was indeed a dislocated shoulder. Once the shoulder is popped back in place the outlook instantly changes. If this happens regularly, riders risk needing a shoulder reconstruction. I have to question why Joey doesn’t offer more transparency to his fans? They want to know what exactly happened and follow his recovery. Hiding the severity of this injury is counterproductive. All his competitors know he has an injury, so hiding from them isn’t beneficial. Joey is one of the most talented riders, but is probably one of the least popular. I think it’s because his post-race interviews lack anything of substance and his lack of transparency with fans comes off as smug. 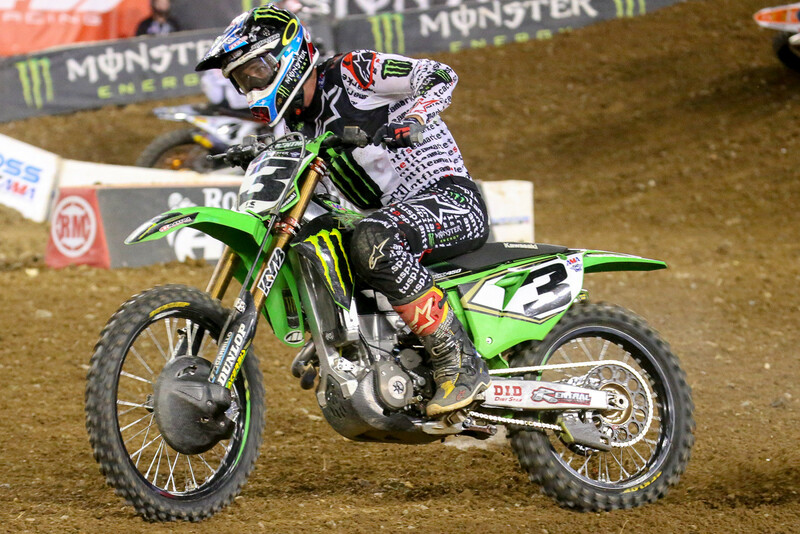 I am not sure what happened with Eli Tomac when Joey crashed, but he decided he wanted to win. Tomac is one of the all-time greats of this sport, but probably the worst all-time great ever. But as an all-time great when he decides he wants to win, there is not much his competition can do to stop him. His win brought him within 21 points of series leader Cooper Webb. If he can close the gap, I will most definitely change my tune when referring to him as the worst all-time great. As we wind down the most exciting and unexpected season, a few questions remain. Can Cooper Webb fight through his burns, bumps, and bruises to win his first 450 championship? Will Ken Roczen ever get that elusive first win with his surgically repaired arms? Can Marvin stop making mistakes and pay back his teammate and rival for rough riding? Will certain Vital members ever stop complaining about the announcers? (Seriously let it go, guys, RC and Ralph are staying). Follow me @chriscooksey61 on Instagram and Twitter, and @Cookseymedia on Facebook. Wish JGR would let Hill go... and hire Davalos. MD did great on the 450 a few year's back and he wants the opportunity to do it again. One wants to race and the other would rather be a musician. That is a great idea for Davalos as I was just saying he needs to be out of the lights class. However JGR seems to be the team that has some bad luck and it seems riders over the last few years dont do as well on that team aside from Weston. Im sure they are having difficulties getting the bikes up to par with the rest of the manufacturers. If Wilson, Reed, Savatgy, Seely and Stewart are available I would grab one of those guys before Davalos. As much as I would like to see him on a 450, he is 32 and will be 33 next year. Bad news for Forkner but I dont feel he knows his limits yet. I do not know much about him but I do not like the idea of Davalos lingering in the 250 class. I feel he is potentially holding a spot for someone else coming through the ranks. Maybe use a points system to finally bump them out of the class or age them out like MXGP but give them to around 28 years old. ET3 the destroyer of Fantasy Supercross pics. If i could pic anyone to be 100% honest in an interview it would be Eli. Something is up and I wouldn't be shocked to see him on orange when his contract is up. K-Roc needs some luck in his corner. Its like Trey Canard left his bad luck demon in the Honda rig for someone new. Ken is riding great and I feel he could have won the last two races with a little luck. Super Cooper is back and playing it smart for the Championship. He is having issues in the Whoops but seems to find a way to get on the box in the main. From his body language it seems like he is playing it safe and a little tentative. Regardless of weather you like Webb or not the turn around with the new team is impressive. I am really curious to see how he will do in the future with more time on the bike and dialing in his training. Nice article! Good insight, but I don’t blame Davalos for riding a 250. It’s the only way he can make a living riding his dirt bike, I would too. I am sure I would too but on the flip side your taking a spot for an up and coming rider who has not been given a break yet.The sport is built on new riders and personalities and Davalos has had his chance many times over. Personally I dont see him being financially beneficial to the team due to his lack of popularity unless PC is getting him for a bargain. Im aware there is a point system in place and guess I should have elaborated that it isn't working well if someone turning 33 is still in the class. MXGP you age out at 23 which I feel is a little young but it works and they are producing more top fast guys. Alot of whom are now stateside and doing very well. Just feel it holds up new younger riders from having better opportunities. Jim Holley for me please, no more Ralph !!! Hey, I like Ricky. How about Ricky & Jim Holley. (lose Ralph Sheen) And Will instead of Blair. Hell, anyone instead of Blair !! !